During these days of Hanukkah some will receive one box that needs no unwrapping: a tzedakah box, used to collect coins for a good cause. Tzedakah (Hebrew: צדקה) is a Hebrew word most commonly translated as charity, though it is based on a root meaning justice (צדק). The Jewish Museum Shop offers the pictured tzedakah box. 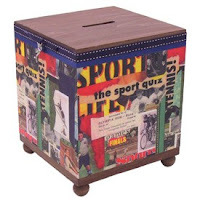 It features a collage of antique sports images and words. A nice gift for the bar mitzvah boy or sports enthusiast.